As organizations become increasingly data-driven by spending more time and resources on analytics and BI, storage performance and reliability requirements are shifting. 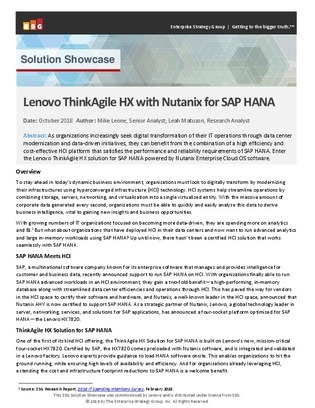 For example, what about organizations that have deployed hyperconverged infrastructure (HCI) in their data centers and now want to run advanced analytics and large in-memory workloads using SAP HANA? There hasn’t been a certified HCI solution that works seamlessly with SAP HANA. View this ESG paper to learn about an alternative, cost-effective HCI platform that satisfies the performance and reliability requirements of SAP HANA.